Camphor (4.8%) (Cough suppressant and topical analgesic), Eucalyptus oil (1.2%) (Cough suppressant), Menthol (2.6%) (Cough suppressant and topical analgesic). Cedar leaf oil, nutmeg oil, special petrolatum, thymol, turpentine oil. Camphor (4.7%) (Cough suppressant and topical analgesic), Eucalyptus oil (1.2%) (Cough suppressant), Menthol (2.6%) (Cough suppressant and topical analgesic). Cedar leaf oil, lemon fragrance, nutmeg oil, special petrolatum, thymol, turpentine oil. AMAZING for cystic acne. The second I feel one coming, I use some on it directly and it will nearly make it disappear. I have tried EVERY home remedy for acne/ cystic acne. 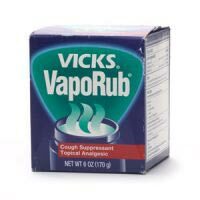 Vaporub is the ONLY thing that works. I find it really works on cystic acne but not so much on other kinds of pimples. It still helps however, so soothing for the skin. its MAGIC. Leave it on over night or even go out with it. You cant even tell it's on the skin. For Cystic acne, at any stage, it will reduce size and heal the skin- seriously almost ASAP> Just try it for yourself! This stuff stopped a blind pimple in its tracks last night, and shrunk the ones I already had! If you catch them early enough mine usually disappear, and it also kills the lasting time of any cysts to around 3 days (for me). Just pop a little on, you should be able to feel a cool sensation but no pain. Only a little bit is needed. I was sceptical, but this is the best thing I have found for my cysts! It is kinda hard to breathe in it, but when you wash your face, your face will become smooth and it will feel minty, Some people went to the hospital from this because they a re allergic to the the ingredients, so check them before you put it on your face. It really works overnight on cysts or poped pimples. In the morning they are so significantly shrunk!!! !